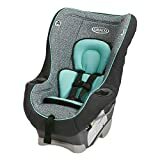 Help keep your own expanding child secure in the Graco My Trip 65 convertible infant car seat, in Sully. The American Academy of Pediatrics recommends your child ride rear-facing up to two years of age, so My Trip 65 keeps your baby rear-facing up to 40 pounds. (baby car seats) and forward-facing until 65 pounds. (as the toddler infant car seat). The seat is also LATCH-equipped, Side Impact Tested, and features convenient integrated mug holders.